Here’s another installment of my For The Record posts, in which seek to disburse information on pieces with available documentation for future identification purposes. While perusing the Neal Auction furniture sections for this weekend’s sale, I noticed a worktable that I have reference material on. This is one of the variants of Kilian Brothers’ work tables depicted in their ca. 1870 catalog. This catalog is shown, in part, in the May 1999 issue of Magazine Antiques. There are two versions in the May issue, an ebonized one from the catalog with the similarly raised table surface as well as a contemporary photo of another, less-ebonized design with a flat, inlaid surface. Notice the female “classically influenced” (as “Antiques” states it) mounts with female busts resembling the carved arms we’ve been beating to death on this site. The female mounts, skirt incisings, leg shape, and urn are all the same, though some hardware on the sides are a differentiation. It just seems there were multiple variants of this table. Here’s a small table we have. I won’t attribute it to Kilian, but I have seen a bunch of variants on this one. 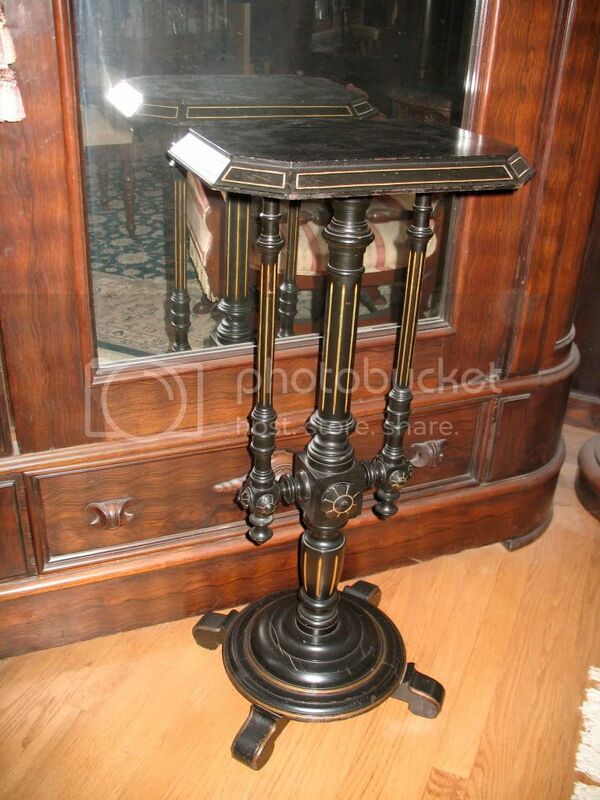 Some are entirely ebonized and some partly ebonized with gilding and different elements. Some are more Renaissance Revival, some are more Neo-Grec but all are made with some parts in common. The manufacturer most likely had stock parts pre-made so the tables are almost modular in construction. This was a great way to keep costs down, while still making a quality product. I am confused. how do you know these are variants by the same manufacturer and not different manufacturers using the same old stock parts ? it seems that items on this site get rounds of applause for being “attributed” with variants and on other highly respected sites the items are similar and made with stock parts by different manufacturers. it makes me suspect of the attribution and the reviewers.